What is it about cooking in a skillet that automatically makes a meal feel more like comfort food? 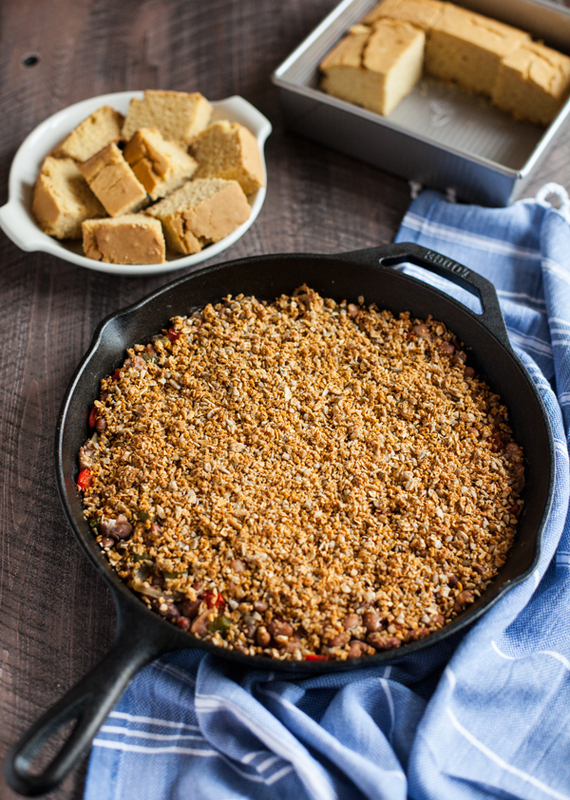 I love the one-pot simplicity of skillet meals, and this pinto bean bake with spicy sunflower oat topping is a perfect example. Hearty, flavorful, and appropriate either for brunch or for supper, it’s a great way to turn humble pinto beans into a complete meal. 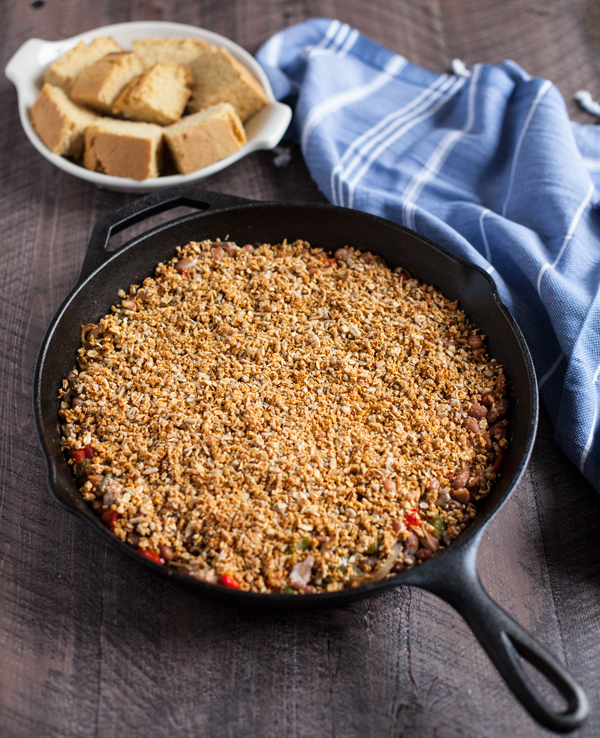 Plus, the spicy sunflower oat topping is a great one to tuck away for all of your casseroles and bakes. It beats breadcrumbs by a mile. Last spring, I mentioned that the UN has named 2016 the International Year of Pulses. “Pulses” simply refers to dry peas, beans, lentils, and chickpeas–in other words, some of the plant kingdom’s most powerful, protein-packed superfoods! Pulses are special not only for their nutritional density (protein, fiber, iron, potassium, folate, and antioxidants), but also because they’re a sustainable, low-carbon protein source that can help to improve the health of the soil in which they’re grown. This year, I’m teaming up with the USA Dry Pea and Lentil Council to highlight more recipes that feature pulses. I do a ton of cooking with beans, lentils, and split peas already, but this is a great opportunity to celebrate these nutritious ingredients a little more creatively. If you guys are interested, you can join me in taking the council’s Pulse Pledge, which means committing to at least one serving of pulses each week (probably second nature for my plant-based readers). You can find more information about the pledge and the benefits of pulses at PulsePledge.com. The Pulse Pledge presents a chance for me to mix it up when it comes to my choice of beans and peas in cooking. I tend to make a lot of black beans and chickpeas, and I’m trying to incorporate variety more consistently. 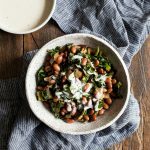 Pinto beans aren’t a pulse that I use very often, but this recipe definitely reminded me of how pleasantly hearty they can be. 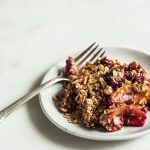 The real trick to the recipe is caramelizing the onions at the very start, so that they get sweet and develop real flavor, and then allowing the Southwestern spices and the tasty sunflower oat crumble topping to work their magic. I love the contrast of the creamy bean filling and the slightly crispy topping. Place the soaked beans in a large pot with enough water to cover them by 2-3 inches. Bring to a boil. Reduce to a simmer, cover, and simmer for 60-75 minutes, or until the beans are tender but still hold their shape and chew (I recommend that you start checking them for doneness at 45 minutes, just to be safe). Discard the bay leaves and garlic, drain beans, and set aside. If you’d like to skip this step, simply drain and rinse 3 cans of cooked pinto beans and add them to the recipe in step 3. While the beans cook, make the crumble topping by putting all ingredients into a food processor fitted with the S blade. Pulse continually for a minute or so, or until the mixture is forming nice crumbs and sticking together a bit. If it’s too dry, add a tablespoon of water. Preheat your oven to 350F. Heat the olive oil in a 12-inch cast iron skillet. Add the onions, as well as a pinch of salt to get them sweating. Sauté the onions for 5 minutes, or until soft and clear. Add the sugar and sauté for another 5-8 minutes, or until the onions are becoming caramelized. Add the peppers, chili powder, cumin, half a teaspoon salt, and a pinch of pepper. Cook for another 2-3 minutes, or until peppers are just soft. Stir in the cooked beans and the lime juice. Mix everything together thoroughly, check seasoning, and season to taste. Sprinkle all of the crumble topping over the skillet ingredients. Transfer the cast iron skillet to the oven and bake for 20-30 minutes, or until the topping is golden. 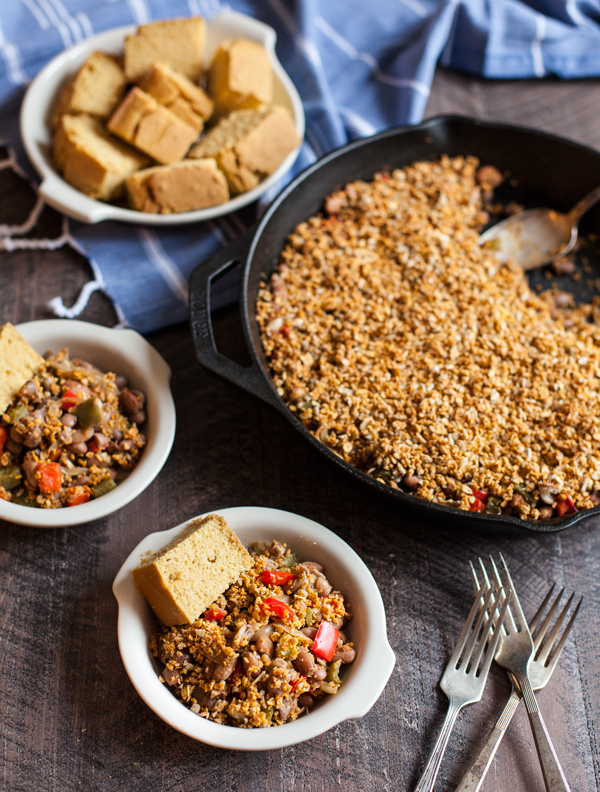 Serve with your favorite cornbread, stuff into taco shells, enjoy with a side of cooked rice or quinoa, or simply enjoy the dish plain! Leftovers will keep in an airtight container in the fridge for up to five days, and can be frozen for up to one month. If you don’t have a cast iron skillet, you can sauté the ingredients in a large pan and bake in a 9 x 13 baking dish. Don’t have pinto beans at home? No problem. This dish will be great with another large, soft type of bean, including kidney beans, cranberry beans, great northern beans, cannellini beans, and even lima beans. You can also mix up some of the vegetables in the filling, using up what you’ve got at home. If you prefer to use a different type of nut or seed in the topping, that’s totally OK, too. 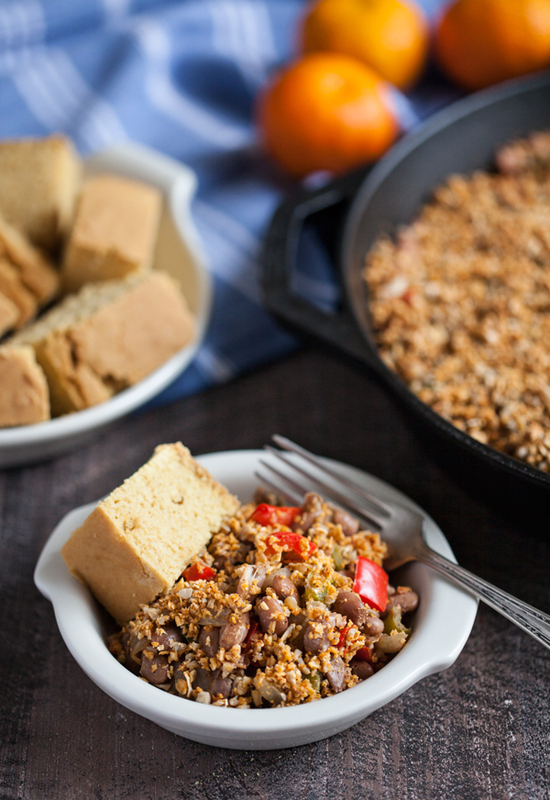 I couldn’t help serving the dish with a big batch of cornbread–the flavors worked perfectly together. 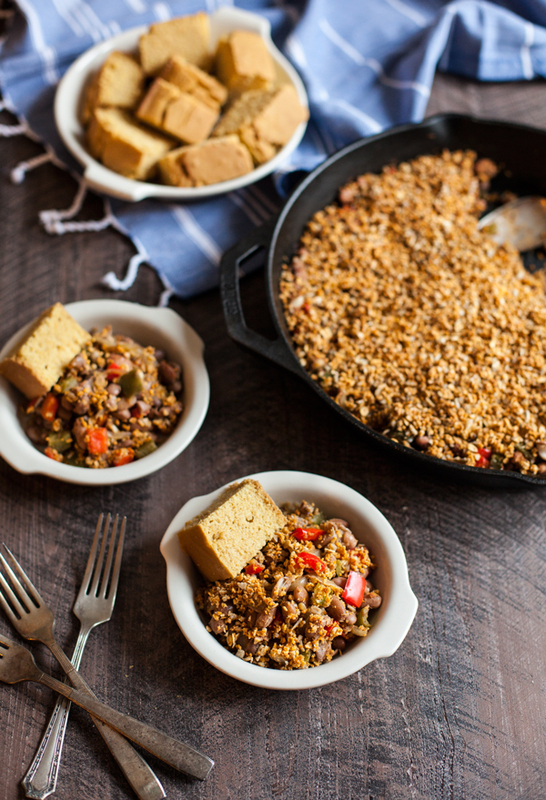 You could use my vegan, gluten free pumpkin skillet cornbread to make this a skillet-themed meal, or my no-fuss cornbread for Food52. Brown basmati rice or quinoa would also be a great accompaniment to the dish. No matter how you serve it, I hope you’ll enjoy it–and since we’re coming up on Superbowl time, it’s worth saying that this is a pretty great, game-day dish to serve a crowd! For more awesome recipes featuring pulses, as well as information on sustainability, affordability, and a host of resources, check out the PulsePledge website. If you’re on social media, feel free to tag your own recipes with #pulsepledge and #lovepulses. The Pulse Pledge is for everyone, but for vegans and vegetarians, it’s a special opportunity to highlight and share a protein source that’s already near and dear to our hearts. Here’s to pulses! This post was created in partnership with the USA Dry Pea & Lentil Council. Opinions are my own. Thank you for your support, and I can’t wait to share more pulse recipes with you this year. It looks like the perfect lunch for tomorrow! Any recommendations for nutritional yeast substitutions? We found out via a meal at Candle 79 that my husband is apparently a bit allergic to it (and also finds it disgusting, haha). We’re not vegan, so we could always add cheese, but I’m trying to cut down on my dairy a lot this year. This is one of those ingredients that’s really hard to substitute because it’s got such a distinctive flavor (I can’t think of another non-dairy food like it). But I think that the spices, seeds, and oats would still be really tasty on their own — just not tasty in a cheesy sort of way. I’d try omitting the nutritional yeast and amplifying the spices if you like. Should be tasty regardless! This is such a unique dish! That sunflower oat topping sounds SO good. I think this is a comfort meal everyone will love! Aw, thanks Maikki! I think you’ll love it. Gena, this is such a creative way to prepare pinto beans! I bet it’s delicious, and pretty fuss free too. I love the idea of the oat sunflower topping. Thank you! I feel like I could just eat that sunflower oat topping by the handful just as it is…. Which seems a bit dangerous. All in all, we also eat A LOT of pulses in our house, and I see this recipe getting some play in winter. Pinto beans are really undervalued in my eyes! I made this dish today along with a vegan cornbread. The perfect flavor balance! I am a long time vegetarian, but recently converted vegan on my journey to ED recovery. Thank you Gena for sharing your story along with these nourishing recipes. i’m considering buying a cast iron skillet. which brand do you use? ist it seasoned or enameled? what would you recommend? not sure if this post is too old to get an answer here, but i try nevertheless. I use seasoned, and it’s this 12″ skillet from lodge. I don’t have much basis for comparison, but it works like a charm, and I’ve had it for over 3 years. thanks! i’ll have a look at that.